Skoda is gearing up for the unveiling of its new family hatchback, the Scala, on December 6, and the Czech carmaker is being ambitious with its replacement for the lacklustre Rapid. The interior design of the new Volkswagen Golf-sized model, previewed in a sketch the company released this week, is said to feature a modern and ergonomic design inspired by the Vision RS concept, complete with the latest technologies. In a departure from past Skodas, the Scala features a freestanding display high up on the dashboard, measuring up to 9.2 inches and linked to new infotainment systems based on the latest Modular Infotainment Matrix. The dashboard itself features a “design line” claimed to echo the contours of the car’s bonnet, and which also forms a wrist rest under the display for operating the touchscreen. 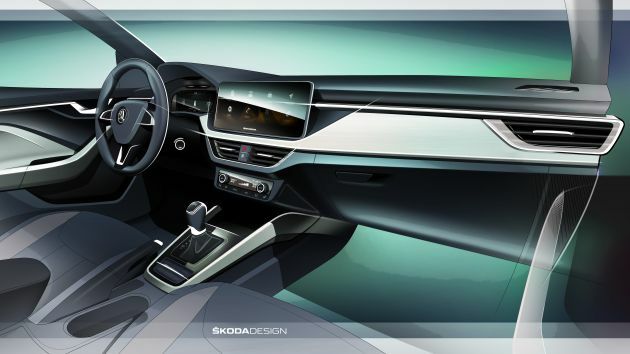 The cabin also boasts soft-touch materials on the dash and door panels, which incorporates large design textures and a new grain that emulates crystalline structures – said to be part of Skoda’s design language from here on out. Also fitted is ambient lighting in either white or red, while the seat upholstery is offered in warm hues and with contrasting stitching for the seat upholstery, with Suedia microfibre trim also available. As far as space is concerned, Skoda says that the Scala offers a “tremendous amount of space,” thanks to the car’s generous 2,649 mm wheelbase. The company claims a total of 79 mm of knee room at the rear – the same as an Octavia, apparently – and a 467 litre boot that it says is the largest in the segment. With the rear seats folded, this increases to 1,410 litres. Other features include an optional 10.25-inch Virtual Cockpit instrument display with five different configurations, plus new Skoda Connect mobile services that allow users to lock and unlock their cars using their smartphone and download map and software updates over the air. Skoda says that all Scalas will be always online, a first for the brand. almost a New gen Proton Suprima. Proton Suprima, just like Iriz and Ertiga are failures. Sales cannot even meet royalty and investment cost. Skoda was a dead company 15 yrs ago. They decided to work hard and improve themselves and not just goyang kaki in opis and mintak bantuan all the time. And to that “parts bin special” list I would add Audi and Bentley. People who talk as if VW is a premium brand make me laugh. Question now is why Skoda is not returning to the Malaysian market? Their latest products are very edgy & quite exciting. Surely the Malaysian will respond very well. And if you want to talk about badge snobbery, Bata is also a Czech brand well received here.